All transactions are safe and secure with a reliable history in online purchasing behind each of our associates. 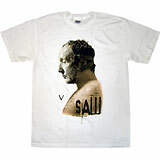 Buy the Saw Tobin Bell Mask t-shirt to own Saw clothing and merchandise. If Saw 5 was your favorite movie, then this Jigsaw t-shirt has your name written all over it. It features actor Tobin Bell's face being used as a mask to cover the identity of the real killer. If you want to know who is killing now, you have to watch the movies. Be sure to pick up the killer Saw movie merchandise like soundtracks, Saw dolls and film posters. They are to die for. In addition to the Saw Tobin Bell Mask tee above, browse the Saw Clothing Gallery for more apparel like men's and women's clothes, kids shirts or hoodies.